Cape Town, 14 August 2018: Over a five-year period, primary school Mathematics and Literacy grades improved by between 25% and 41% among children on rural farms in the Cape Winelands participating in an after-school education, sports and life skills programme. Of the 667 learners in the Anna Foundation 3R’s programme (Reading, Running and Right-ing), 608 are in primary school and improved their performance in Maths and Afrikaans from being involved in the after-school programmes facilitated by the Anna Foundation. Each child benefits annually from 200 hours of educational support, 100 hours of computer access, 100 hours of reading, sport and life skills training, plus 200 cooked meals. “Our all-encompassing holistic approach to building a solid community of support around the child has proven a success over the past 14 years, especially in Maths and Afrikaans. Our goal of building the child’s self-esteem and self-worth are evident in the success of children who are integrated into Anna Foundation programmes,” said Anna Brom, Director and Founder of the organisation. Expanding access to quality after-school programmes is one of the objectives of Western Cape Education Department’s Game Changers. The aim is to get 112 000 learners from poor schools into after school programmes by 2019. Last year an international study measuring reading literacy levels scored South Africa the lowest out of 50 countries globally, and the Anna Foundation is making it its mission to change this. 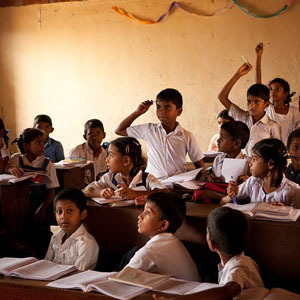 “Children with little or no pre-school education and who attend resource deprived school with large class sizes often lack good numeracy and literacy skills.The after school programme at the Anna Foundation, is designed to bridge the gap.”, said Carol Sampson, Senior Project Manager at the Anna Foundation. In 2011, the trends in International Mathematics and Science Study (TIMSS) showed that South African learners have the lowest performance among all 21 middle –income countries that participated and in the 2012 Annual National Assessments for Grade 9 Mathematics, 91,9 % of the learners scored less than 30%. Within this context, the Anna Foundation has made a concerted effort to use innovative and creative methodology to consolidate the maths taught to the children at school. Many of the children also participate in a variety of sporting activities, one of the pillars of the organisation. The intervention of the Anna Foundation has intercepted many individual lives and offered them scholarships and mentorships. Grade 7 pupil, Randy Daimane is a scholarship pupil at Stellenbosch Primary School and her scholarship will continue to high school. Mariska Goliath is displaying her leadership capabilities by being part of the Student Representative Council at Stellenbosch High School (where she also has a scholarship following her Primary school scholarship). She’s a keen netball player and hockey player and has represented Boland Province in the past.. Keen rugby player, Debroh Zass is in Grade 6 at Robertson Primary. Juanita van der Ross, in Grade 7 at Robertson Primary School is a bursary student who brings her love for learning and singing to school every day. Chantal Philander, a bursary pupil from Buffet Olives will be studying Fine Art at the University of Western Cape. Her bursary includes study, accommodation and books. Mervin van der Ross has been awarded a conservation learnership for the course with Wilderness Foundation Africa. This follows his giving back as a facilitator to the Anna Foundation from Hugenot Primêr in Robertson.